A GRIP ON SPORTS • Well that was weird. All day Saturday, I mean. Just weird from Los Angeles to Seattle. Maybe not in Pullman or Cheney, but weird everywhere else. Read on. • If you just go by scrimmage statistics, the quarterbacks at Washington State, Eastern Washington and Idaho were pretty darn good. Few passes hit the turf during any of the scrimmages, with WSU presumptive starter Gardner Minshew completing 13 of 18, Eastern standout Gage Gubrud 8 of 14 and the pair battling for UI’s starting spot, Mason Petrino and Colton Richardson, combining for 10 touchdown passes. Being that all those teams feature the passing game, that’s good news for their fans. But scrimmages are just that. Competition between teammates. For every good a player does, there is often a corresponding bad. It’s almost Newtonian in its simplicity. Leach is right, you know. Colleges should be allowed to hold one practice with another school, if only to break up the monotony of preseason practice. • Speaking of preseason, the Seahawks played their second game. And picked up their second loss. 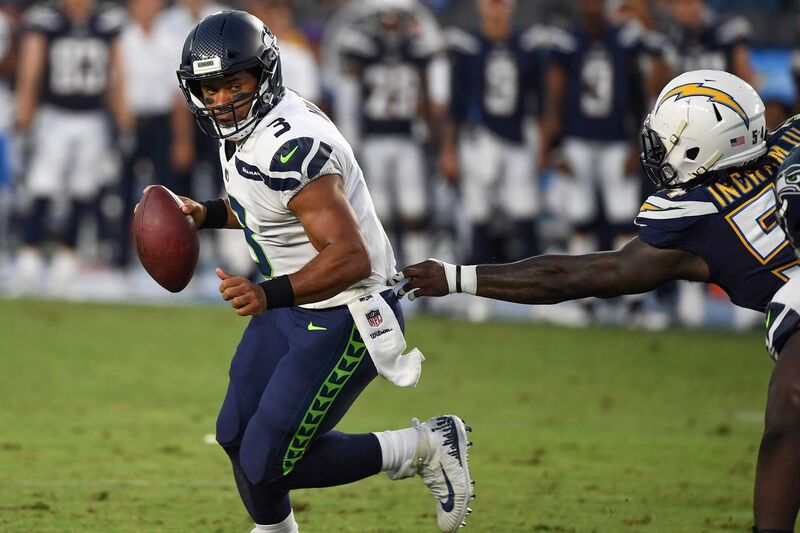 It is hard to make many pronouncements about the regular season after two preseason contests, but we think we are on solid ground with a couple: a) Germain Ifedi is still struggling; and b) the Hawks pass rush needs to get better or it’s going to be a long season. Ifedi had better improve, and improve quickly, or the last two weeks of preseason games should be tryouts for his replacement. The other problem may be more serious. The worries about the secondary are well-documented but that group and the pass rushers work in tandem. A great secondary can survive with a mediocre pass rush. And a great pass rush can cover up for a mediocre secondary. But if both are mediocre, watch out. The Hawks have excelled in both pretty much since the Pete Carroll/John Schneider era began. Without some quick improvement, it will be a weirdly long year. • It’s not often you see a game end on a walk-off. I mean a real walk-off, as in Cameron Maybin walking home from third on Dylan Floro’s bases-loaded balk. A walk-off balk has an interesting ring to it. But that’s how the M’s won yesterday, with Floro moving his hands and legs before stepping off the rubber – and getting called for it. Not that the M’s are complaining. The game was already weird enough as they scored four times in the first and not again until the 10th. Or Alex Colome giving up two eighth-inning bombs that pulled the Dodgers within 4-3. Or Edwin Diaz, who had converted 28 consecutive saves, missing his spot by about a foot on a 3-2 fastball to Max Muncey in the ninth and yielding the game-tying home run. But a win is a win these days and it allowed the Mariners to pick up a game on Houston, which lost again to Oakland. The A’s are in first place. Well, tied with Houston at least. And, after the first few months of the season, that seems really weird. WSU: Theo Lawson was at the Cougars’ scrimmage yesterday and he has five reactions to what occurred at Martin Stadium. He also has post-scrimmage interviews with Mike Leach, defensive coordinator Tracy Claeys, Minshew, linebacker Jahad Woods and running back James Williams. … You may just remember this guy when he was a freshman at WSU. … Elsewhere in the Pac-12, the Huskies are a bit thin at tight end, but expect Drew Sample to lead the way. … Even third-string quarterbacks have to be ready, at Oregon and elsewhere. … Though it was not open to the public, the players at Oregon State say their second scrimmage was better than their first. Though who would expect them to say they stunk? … California believes it has some depth at the quarterback spot. … Stanford can be good if the defensive rebuild works. … Yes, Colorado feels its punter is a weapon. … With a veteran quarterback in charge, Utah’s offense is where it wants to be. … USC doesn’t have a veteran quarterback and the offense is still trying to find itself. … UCLA is also trying to decide whom to have play quarterback. … Arizona State will rely on a lot of new players. … Arizona has struggled recently in the punting game. … In basketball news, Arizona’s Sean Miller had a few things to say about his new roster. EWU: The offense struggled to find the end zone Saturday, as Ryan Collingwood explains in this story from Cheney. Libby Kamrowski also has a lot of pictures. Idaho: Many of the Vandals’ scores came on short-field situations, with 30 yards or less for the defense to defend. Peter Harriman has that nugget and more in his story from the Kibbie Dome. Indians: Spokane stay in first place was a short one, as host Vancouver won 4-0 yesterday to move back a game in front with 15 games remaining. … Around the Northwest League, first-half champion Everett is in a slump. Preps: There is no longer a chance for Coeur d’Alene’s Little League team to win the World Series, but it does have one more game left after its 3-0 loss to Georgia yesterday. … A former Gonzaga Prep standout who competed at Whitworth was named the Northwest Conference’s woman of the year. 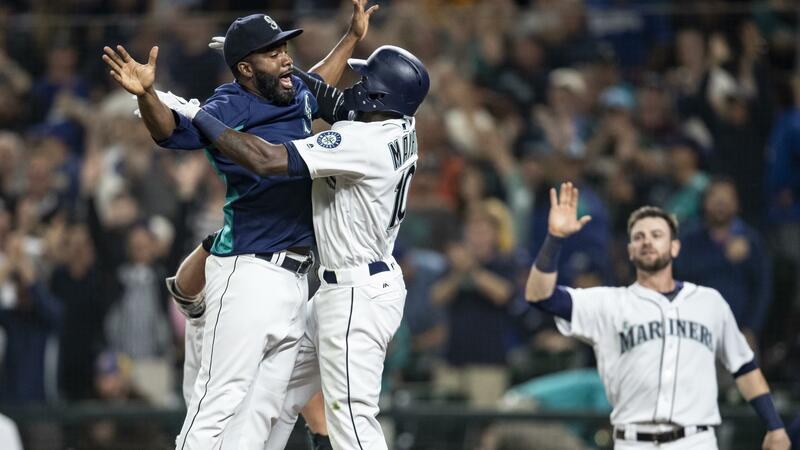 Mariners: Gene Warnick has our Out of Right Field column today. He examines the M’s playoff chances. … Yes, Diaz finally blew a save. There was one bad pitch. … It’s Sunday, so we have Ryan Divish’s mailbag. … More and more, position players are pitching some. … There was a roster move yesterday. Seahawks: The Hawks lost 24-14 at the Chargers last night, doing some good things and some bad things. … A few players sat out. Sounders: Not only did the Sounders rout Los Angeles 5-0, the referee ended the game right at the final horn. No extra time for this blowout. … Seattle seems to make a late-season run every year. Published: Aug. 19, 2018, 9 a.m.